Imagine you are the CEO of a retailer. The economy is roaring, people are starting to shop more at your higher end shops, increasing margin. Quarter over quarter top line revenue growth is coming in, albeit at a slow, measured growth rate. You are even getting some level of margin growth by implementing some measures to remove excess cost out of the business. Things are going great! Then, some year, everything changes. A new competitor emerges. Similar brand strength, similar cost structure, even similar locations. However, they seem to get twice as much revenue per square foot, based on some new traffic pattern analysis that they are doing. And they seem to have very savvy staff who are empowered by their systems to recommend products for customers that they seem to actually want to buy. This, when combined with the investment they have made in omni-channel customer experience, is allowing this new upstart to drastically cut into your marketshare. You are paralyzed by fear. You’ve read a few articles about big data, but given you are a brick and mortar retailer focusing on the high end, you did not think this was as much of a priority. You’ve been focused on cost control and squeezing an extra 10 basis points of margin out of your existing model, and your competitor has leapfrogged you by creating an entirely new model that increases margin 2%. In retail. Where such a margin increase can mean profits rise by 40%. You used to be aware of analytics. Now you need to lead the charge to be analytics led, before your competitor ends up beating you so badly that you become an aquisition target – with your declining brand and your real estate becoming the only assets that remain. You are faced with a new imperative – how do I drive this organization to become analytics led, and in a way where I can “re-leapfrog” this new upstart competitor? Becoming an analytics led company – a company that drives strategic advantage through analytics – is a journey that requires rethinking of how your entire business operates. It requires agility to be able to change tactics and strategies in response to data coming from how your customers interact with your products, retail locations, and your brand in general. You will not get there overnight. There are, however, traits that such companies share – traits that you can use as a marker to know whether you are at least on the way to becoming such a company. For purposes of this discussion, contextual intellectual capital is the sum of learning from analytics that has taken place and exists in the minds of people actively involved in shaping the business. For example, a tuned collaborative filtering model that forms the basis of a recommendation engine, paired with data scientists who know how to evolve the model, could be considered such capital. It is contextual, because it’s value is derived from properties unique to the company – the brand, the people, the culture, the customer base. Even if you “copied the code” to a different company, it’s value would deteriorate, because it is optimized for that particular brand. Analytics led companies have a great deal of contextual intellectual capital. It is the models, the learning, and the people who know how to leverage and improve the model. It is the ability to create new models in response to changing business conditions – that build on what is learned from prior models whose value is derived not just from the math, but the context they come from. One of the more surprising things you find in analytics led companies is that, while they are naturally driven by data, as you would expect them to be, they do not completely discount intuition. Intuition is a unique capability humans have for processing lots of complex information from diverse sources in parallel. This ability is something that humans excel at much more than computers do. What does this mean? A human will have the context to intuitively know, based on data on whether a model has worked (or not) how a model may need to be tweaked. Intuition will give us a safe harbor to know when results from a model that is new should be called into question. For example, if a new model for managing up-sell recommendations is having great results well beyond what it should, intuition will tell us to look at the data closer so we can know whether some one time black swan style event is influencing the recommendation. For example, during a cold snap, more people may buy face-masks that cover your entire face while they are buying new winter coats – but that does not imply that such face-masks should always be up-sold, as this condition only exists perhaps when the temperature goes below 10 degrees Celsius. Models running 100% unmanaged, if they are not including weather in the analysis, would not pick up this detail, where a model combined with intuition is much more powerful. Analytics led companies usually think quite a bit differently about what the source is for sustainable value. At first glance, a competitor may think it is the presence of a killer model that tells them what customers want to buy with incredible accuracy. However, as valuable as that is, in a competitive market, competitors will quickly figure out ways to reverse engineer and replicate the model. It is not a static model that really provides the value in an analytics led company, it is the organizational capability to learn from and quickly adjust the model to changing conditions. Imagine you are a retailer who has been selling products in primarily western economies for the last ten years. As you move into emerging markets, how does the system that evaluates product mix change? Organizations that do not have agility to update and evolve models risk using inappropriate models for new conditions and situations. Companies that are optimized for learning can quickly adjust to new realities and change models to meet new business conditions. Is there any type of science that isn’t driven by data? Analytics led companies understand that data science is really *business science*. Such science has a process, and that process is the scientific method. You form hypotheses, you test them, and if they fail, you learn and move onto the next hypothesis. Data science as a term may be a fad, but the scientific method, and application thereof to business, is most certainly not. Part of science, of course, is embracing failure of models, even if the ideas behind them come from a high ranking executive. Proving that models don’t work, in science, is just as important as proving that they do. In analytics led companies, while intuition matters (see above), when a hypothesis is falsified when under test, the outcome is accepted in favor of alternative hypotheses. The rank of the idea’s progenitor does not apply. In analytics led companies, the CIO does not buy analytics tools based on conversations that occur on a golf course. While tools are used, tool choice is vetted by the data science team. Thankfully, most data scientists tend to be very pragmatic about tool choice. The tools of choice these days tend towards free or open source when possible – things like Hadoop, R, Python, and related libraries. Paid, proprietary tools have their place in certain situations, but the defaults tend to be tools that lower the cost of experimentation, so that too much capital does not get spent in yet to be unproven ideas. Nobody wants to invest seven figures in tooling for a model that may not work – for at some point, too much investment in an unproven model will create pressure to “make it work”, even if it turns out to be wildly wrong. The most important trait of analytics led companies – above all – is that there is confidence that science properly applied to business has potential to deliver breakthrough value. The executives have not only seen it in competitors or upstarts encroaching on their turf, but they are prepared to compete by executing an analytics strategy that plays to their own strengths. Does this mean that brick and mortar retailers all replicate the strategy of Amazon? Of course not. It means a contextual strategy that plays to the retailer’s strength. If it is a retailer that has strong location coverage in certain kinds of communities, the analytics strategy will consider that. If it is a retailer that has a brand that appeals to a different kind of consumer, it will consider that as well. They deeply understand that context matters – and that the unique combination of analytics model, people, corporate culture, and brand for the basis of a successful analytics strategy. There is no doubt “Big Data” has taken the tech world by storm. I have spent much of 2013 talking about analytics and data science with people all around the US, going to conferences like Strata, and immersing myself in this world for the last 12 months. Over the course of this journey, I have started to notice some patterns about how various people in various kinds of organizations understand and invest in analytics. The analytics led company is a concept I will define here as a company that seeks to use analytics (predictive, prescriptive, or descriptive) as one of their chief competitive weapons. The canonical example is Amazon, whose use of analytics is part of the DNA of the company. However, there are other more traditional companies that are analytics led, such as Walmart, Proctor and Gamble, Kolhs, and dozens of others. In companies that are analytics led, analytics capabilities are spread throughout the company. They are not siloed off to some group in IT that does “analytics stuff”. Such organizations, knowing that analytics has to be a core competency of the company, invest in people – data scientists, data engineers, data savvy analysts and developers, and free them to use whatever tools and techniques are required in order to generate business results. The next category in the continuum are analytics aware companies. These organizations see the competitive threat. Many may be piloting technologies or starting to do some discovery work in small areas. They see the value, but have not yet integrated analytics into the DNA of the company and made analytics something that would be considered business as usual. These organizations often have a siloed group doing experimentation, and this siloed group often has ties, or is directly part of, the traditional IT department. 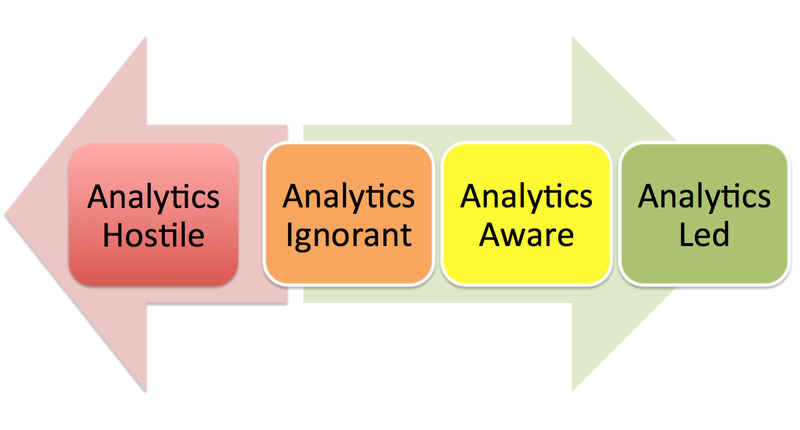 Further down the spectrum are analytics ignorant companies. When a company simply does not see the value of predictive analytics, and rather seeks to gain competitive advantage through other means. Finally, at the other end of the spectrum, are analytics hostile companies. They may have sought to use analytics and failed – and then soured on the idea. They may have a technology hostile culture in general. Regardless of reason, they make very good targets for analytics led companies that seek to steal marketshare. Most industries, though not all, have had the emergence of at least one new competitor who has used analytics to achieve some sort of competitive advantage. Whether it is organizations like Progressive Insurance who use analytics of how you drive via it’s Snapshot tool to allow for better underwriting, or its one of the many online and offline retailers who are using analytics to understand or predict customer behavior, if you are the CEO of any industry where one of these upstarts have emerged, you have likely at least made your executive team aware of the threat. That said, in industries that tend to be less competitive, due to either higher barriers for entry or presence of a monopoly – the urgency for analytics is much less. These types of companies, utilities, some telecoms, and a few others, means that even if the potential for additional profit is there, the lack of urgent need tends to move analytics to the back burner. It is only when a competitive threat from a related industry emerges (i.e. Google cutting into the Yellow Pages revenue) that such organizations move from Ignorant to Aware. In analytics led companies, the approach towards data science will generally be to build the capability in house. Leaders of such companies understand implicitly that analytics is deeply business relevant. They know that predicting customer behavior and anticipating customer needs – and most importantly – connecting those insights to the rest of the business – drives profit margin, customer loyalty, and numerous other outcomes that are core to mission. Analytics aware companies, on the other hand, will tend to know they need those outcomes, but do not have the capability to achieve them. They often try to achieve analytics by purchasing technology – usually applications that have some analytics capability. While this approach can help the company at least get to level compared to their peers, they do not allow a company to exceed very far beyond their peers, as if one company can purchase a product that does analytics, so can competitors. There may be a short term advantage, but it isn’t sustainable. Some analytics aware companies may seek to purchase the capability either through acquisition – buying a company that is analytics led and hoping that the new company unit will enable the entire organization to also be analytics led. While such moves have a better chance of providing competitive advantage than buying a product, it is risky, as this pattern tends to lead to siloed analytics capabilities within a business unit that used to be the old acquired company, unless the acquisition is properly integrated (which seldom happens). Data science will obviously be more valued in organizations that are analytics led. However, the most interesting opportunities for change tend to be in the organizations that are analytics aware. The analytics aware organization is the class where the value is understood, but a brand new culture about how to leverage data in new and interesting ways can be fostered. In analytics led organizations, especially ones that have been analytics led for quite some time, certain conventional wisdom may already be in place about what is possible and what isn’t. Often, such “wisdom” constrains the idea-space, causing the most ambitious ideas to sound too big, audacious, or disruptive to be viable investments. On the other hand, analytics aware companies have experience spending large amounts of money on product and acquisitions. Such costs tend to dwarf what the cost of a competent data science team would be. One can take the budget that is spent on tools and acquisitions, redirect it towards an innovation lab that serves business line leaders, and get a far superior return on the investment. What is the takeaway of all this? Do not despair if you are not analytics led…. yet. Use it as an opportunity to redefine the kind of analytics that your organization will use, an opportunity to chase more audacious ideas than than people with an abundance of conventional wisdom would ever consider.